I had a very good impression with Astons Specialties down at The Cathay Building. I cannot say much about the quality and food here. It did not go well with me at all. I wished it was a typo. And I wished the crap tasted better. Steak with Apple sausage with sides of Cheesy pasta shells and potato skin. Only sides were not too bad. No comments on the steak. Why in the world would they give shitake mushrooms? Why? Does it enhance the taste of the steak? It looks like it was cooked to perfection and was impressive but was actually tough and sinewy. Bloody tiring and tiring to cut the meat into pieces, I almost gave up eating the steak altogether. I would just go down to the Cathay branch for their steaks as this is not worth its price. 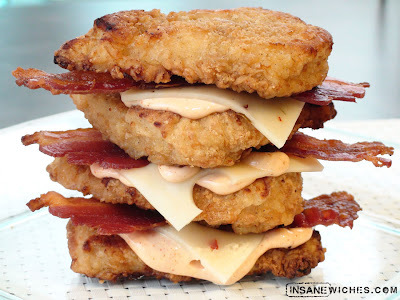 Following up on my previous post on crazy, artery clogging eats, I found this simply intriguing. This is something found in KFC in the States but they are testing out the response. Using the chicken patty as a bread replacement is actually not unheard of but what attracted me in this picture was the actual bacon being used. The last I've heard about beef patties having the same concept and using a fork to eat this messy meal. So long burger buns. R.I.P. I had dinner with Zobo at Sushi Tei after not meeting up for 2 years. I was pretty intrigued by the fact that they have otoros in their menu and even much so after finding out that its $28. Tastes like how it looks. Not bad. This was ok only. Not very good. Any fried rice is good for me. Some Japanese Steamboat thing with salmon belly and other fatty fish. This was seriously too much for 2 but we just indulged and finished them all. This was the result of not meeting up for 2 years. I tried Sushi Tei at Paragon last night and I didn't like it. I suppose this was one of the better branches around. First up is the Banana Cream Pie from PS. Cafe Paragon. This is one hell load of whipped cream. I think to myself why is the cream tasteless? Is it a fat free whipped cream? It does not taste sweet nor salty. Much less creamy. And they do charge a buck for extra cream so please ration them if you are a whipped cream freak. Then the freshly cut bananas taste....like how it should be. Then followed by the caramel on top of the pie crust. This is the part where I think to myself again that this stuff is too sweet and I could make it at home. The caramel has done it for me. Overdosed on sugar because we had a key lime pie together with this. I should skip sugary stuff for the week. Credits to the Inspiration Gallery for their wonderful background. Thank you faeries, Gab & Anna for always giving me the honest opinion in my culinary experiments.